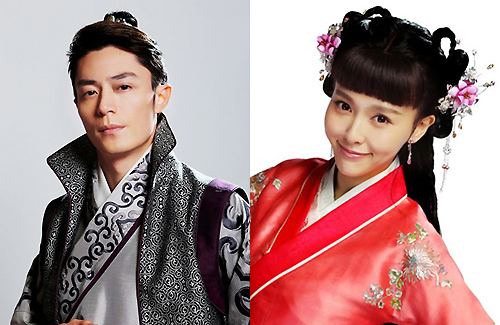 The ancient drama Perfect Couple <金玉良緣>, starring Wallace Huo (霍建華) and Tiffany Tang (唐嫣), recently began filming in Hangzhou. After their collaboration in Chinese Paladin 3 <仙劍奇俠傳3>, the two have become an ideal couple in the eyes of fans, especially since both are currently single. However, while Wallace shared that he appreciates his friendship with Tiffany, it is unlikely that the two will enter into a real-life relationship. Tiffany, who also has her own production company, shared that she gleaned a lot of business knowledge from Wallace, such as the idea of building a foundation for oneself as a producer. She added that, in the five years since they last collaborated, Wallace has become livelier and more easygoing, although he is very serious when it comes to work. Since her messy breakup with Taiwanese actor Roy Chiu (邱澤), Tiffany’s love life has been at a standstill. Although Tiffany said she is currently focusing on work, she also revealed she is still waiting for her perfect match to find her, though she knows that perfect couples cannot be found at random. Saw the trailer for this series….mehhh. It is great that they are good friends in real life. Even if you can’t date or end up together, being great friends for life is not bad either. On screen and real life are 2 different worlds, just because you have chemistry on screen does not mean that it will translate to real life. IN some cases yes, but most of the cases, it does not happen. However, years from now things can change so who really knows??? Timing wasn’t right then. Now timing may be right. And of course she likes him. Anyone who saw the BTS where they kissed will know obviously she likes him, a lot. You may be right. But passionate kisses on screen doesn’t prove anything. It could be the camera angle and the actress’ ability. And what does BTS refer to? if i remembered correctly, he was also very passionate towards Michelle Ye in Tian Xia Di Yi. How do you know that for sure?? I have seen many who seem to really like each other but they truly don’t in the end. Which series/movie is BTS??? Even IF they did like each other, of course they will not admit it(at least not now). If they do, good luck to them and time will tell all. I love them in CP3 together, but on screen and real life are 2 different worlds. the first 1/2 of the trailer is hilarious!!! it’s nice to see that they’re such great friends. Hu Ge personally invited Tang Yan in his first tv production. Now, Wallace’s first series as a producer and his choice is also Tang Yan. them three are so cute!!! The only reason Hu Ge was so-called “producer” of Xuan Yuan Sword was because so he would agree to star in the series. The series was put on hold to be made wayyyy before even CP3, so there’s no way Hu Ge could be the “producer”. Karen was the original producer but handed the title to him. And the series still stank. Karen was still listed as producer. That woman did not hand off the title to any body. And I agreed that the only reason Hu Ge was able to buy his way into being a producer was because Karen wanted him in the series. The original script was tailored for LSS (this was in one of the interviews Karen did back in 2010) however, she knew LSS only would not be able to attract viewers, so she & Hu Ge struck a deal. Hu Ge joined the cast but only wanted to be YWT, instead of CJC, the main character. Of course, they can’t have Hu Ge in supporting role, so the script was altered significantly to give YWT more screen time. Though the series was horrible, but it topped the charts for a number of weeks with very high rating. The only reason why it did well was because Hu Ge, LSS, and Tang Yan’s fans were supporting their artists. But most agreed that it was a terrible series.